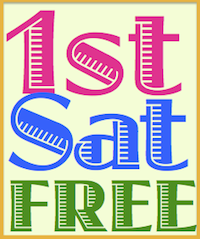 The Carnival of Genealogy (COG) is a bimonthly blog event invented by Jasia of Creative Gene in June 2006. Individual genealogy bloggers write about an assigned topic and post the articles on their blogs. Each carnival edition has a host who gathers the submissions and publishes a round-up of links to the articles. This is my submission to the 84th edition: What the Carnival of Genealogy has meant to me. 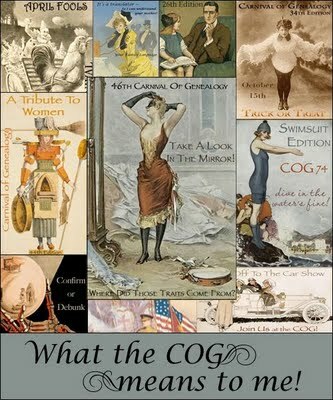 The COG was a fixture in the genealogy blogging world before I knew much about blogs or ever heard of Jasia. Ironically, I first learned about her from a print article in the July 2007 issue of Family Tree Magazine. In my first blog post, An Experiment, I reported on how Jasia's series Declining Membership in Genealogical Societies led directly to the start of this blog. But that's not to say that the COG hasn't played an important part in my blog upbringing! My favorite contributions to the COG have been the tributes to women written the last two years in March for National Women’s History Month. It has been an honor to meet so many generous, talented members of the society and writing about them is the best part of the CGSL blog. I plan to write more tributes and more frequent member spotlight articles in the future. One edition of the Carnival of Genealogy stands out for me from all the rest – the 77th Edition Disasters hosted by Miriam Robbins Midkiff at her award-winning blog, Ancestories: The Stories of My Ancestors. Miriam did a stellar job with the submissions, organizing them into themes and introducing each with a fitting quotation. The packaging was every bit as interesting as the articles themselves. I was amazed at much time and care she had put into the presentation. Her creativity inspired me to volunteer to host a future edition of the COG on the CGSL blog. Of course hosting on this blog meant that the the theme would have to relate somehow to CGS – a rule that keeps me focused on my niche. That led directly to the idea to start a new blog carnival devoted to genealogical societies. Now it is time for true confessions! I took credit for a new GenSo Carnival (coming in January 2010) and Jasia was a supportive co-conspirator. Just as she graciously announced the start of the CGSL blog to the world, she offered the COG as a launching pad so I could publicize the new carnival and Carnival of Genealogy 82: Breaking Into Society was the result. This is another ideal way for a genealogical society to advertise and promote their organization. Start a carnival and rotate hosts among group members. Other carnival watchers and bloggers will find it and you'll increase your group’s exposure. It's great advertising to sponsor a carnival! Jasia, I apologize for usurping your idea. It was all you, as always! The fourteen articles you wrote have been a road map that I have been following for almost two years. To say that you have changed my life is NOT an exaggeration. I spend a part of nearly every day working on something for the California Genealogical Society that you outlined in that series. Thank you for creating this edition of the COG so that I could publicly acknowledge your continuing support and encouragement. In this case, imitation really is the sincerest form of flattery. I know that COG means Carnival of Genealogy but I am sure that gen-bloggers everywhere will agree that it also stands for Community of Geneabloggers. I can't thank you enough for showing me the way. Thank you for your kind words about my hosting the 77th COG, Kathryn!